You have to register as a bidder in advance in order to participate in the auction. You can either bid personally in the salesroom, or by telephone or absentee bid. You can register in our office or send us a request in writing (by email or fax) for telephone and absentee bids until the evening before the auction at the latest. Please note that you must provide an identity card or send us a copy of your ID and your bank details or credit card number if you are registering as a new customer. Will you be personally present on the day of the auction? Bids by customers present in the saleroom are made by clearly showing your bidder number. Bidder numbers are assigned to a bidder on the viewing days and prior to the start of the auction. With regards to telephone and absentee bids please note the information on our forms. Telephone bids are only accepted if you have registered by forwarding a duly filled in Telephone Bid Form. A telephone operator will carry out the bidding in the salesroom on behalf of the bidder. Absentee bids are only accepted if you have registered by forwarding a duly filled in Absentee Bid Form that has been signed personally. If several absentee bids of the same amount have been made for the same item, acceptance will be awarded to the bid that was received first. You win the bid with the Hammer Price, after the bid has been called out three times without a higher offer having been made. In individual cases the auction house may award acceptance of the bid subject to reservation. Your bid was successful and you have purchased an item at auction? Congratulations. We will send you your invoice by email. We accept payments in cash, by card or by bank transfer. Cashless payments must be made at no charge to the auction house. Please note that in addition to the hammer price, the buyer also has to pay the Buyer’s Premium of 29.5%. This includes the statutory value added tax of the hammer price. Collecting your purchase is straightforward. The auction house stores and insures your purchased items for the value of their hammer price for a period of two weeks after the date of sale. Following this, items will be stored for a fee by a forwarding agent. We are happy to assist you with the transport of your items after having received your instructions in writing. The auctioneer shall only be liable for the orderly delivery of the items purchased at auction to the forwarding agent, the freight agent or any other persons designated to handle the transport. This page provides general information. If you need any further information, please also see our FAQ’s. Please also refer to our Auction Conditions. We are also happy to assist you in person Contact us! The estimated prices stated in the catalogue of the Auction House are only a non-binding indication for the successful bidder. They may be minimum hammer prices if the Auction House has agreed upon a limit with the consignor. All estimated prices are stated in Euros; accordingly, the acceptance of bids is also in Euros. Any and all statements in foreign currencies shall not be legally binding. All auction items may be viewed on the premises of the Auction House before the auction during the preview periods and examined without time limitations. Generally, auction items are used items, are of a certain age and are in a condition – particularly relating to their state of preservation – which corresponds to their provenance, age, use and application up to the present time. Accordingly, all auction items are sold by the Auction House in the condition applicable upon acceptance of the bid [“as is“]. We recommend a personal exhibition. Any objections possible, relating to the condition and/or state of preservation of the auction item, shall only be mentioned in the auction catalogue or any condition report if, of the opinion of the Auction House, it significantly distracts from the overall visual impression of the auction item. In this respect, the absence of references to repairs, additions, restorations, removal of frames, damage etc., or other measures taken on the auction item, does not imply that an auction item is in poor condition from an objective point of view. If and to the extent that it auctions for the account and in the name of the consignor, the Auction House does not assume any liability for defects, provided that it has complied with the duty of care incumbent on it. We will be happy to provide you with a condition report for works of art with an estimated price over € 1,500. This customer service does not allow for any deviations from, nor promises in excess of, the auction terms. Bidders must register prior to bidding, even for written and telephone bids. We may request proof of securities or solvency from new bidders. Please note the corresponding directions listed in the forms as well as our employees’ directions. We refer to our bidding terms. Paddle numbers are handed out during the pre-auction exhibition as well as just before start of the auction. We recommend that you pick up your paddle number already during the pre-auction exhibition since we usually experience a great rush of people on the auction day itself. Bids by persons who attend the auction in person shall be made by clearly raising the paddle number. Bids by persons not present are only allowed if the bidder has applied for admission no later than in the evening before the day of auction. Bids made by telephone shall only be admitted if such bids are applied for by submitting a properly completed ”Bids by telephone“ form provided by the Auction House for this purpose. Bids by telephone are carried out for the bidder by a telephonist present in the auction house and may be recorded by the Auction House. The bidder consents to such recording by submitting the application to bid by telephone. Bids made in writing can only be made by submitting a properly completed ”Bids in writing“ form provided by the Auction House for this purpose, which shall have been personally signed by the bidder. If several bids of the same amount have been made in writing for one and the same auction item, the bid which the Auction House received first will be accepted unless a higher bid has been submitted or is made. If several bids are received on the same day, the bid awarded shall be decided by lots. The contracts shall be concluded by the acceptance of the bid to be awarded if, after three calls on a bid, no higher bid is offered. In individual cases, the auction house may, accept the bid through the addition “with reserve” or “u.v.”; “n.v.” means “not sold”. In addition to the hammer price, the buyer shall pay an extra charge of 29,5%. The value added tax upon the commission shall be included and not separately shown. Otherwise, the calculation of a separate value added tax to be disclosed which falls to the hammer price is explained in the part “VAT”; reference shall be made to this. 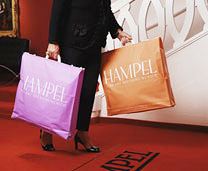 Items signed with a „†“ are sold in the name of Hampel as commission agent for the account of the Consignor and are subject to regular VAT taxation. The VAT of 19% will be added to the hammer price of these items as well as on the buyer´s premium of 24,79%. The VAT will be shown separately on the invoice. Reference is made to the catalogue regarding additional explanations. In particular cases, Hampel may opt for the rules of section 25a German Turnover Tax Law (“UStG”) to apply, so-called “margin taxation”. The VAT ID system will be applicable for European buyers. A VAT refund is only possible for Non – European exports. The buyer shall assume in the ratio to the owner the payment of half the statutory droit de suite charges. This is shown separately on the invoice and shall be owed pursuant to section 26 subsection 1 Copyright Act (UrhG) when selling the originals of a work of fine arts or photography in which the copyright has not yet expired. The amounts owed by the successful bidder shall be due and payable in cash upon acceptance of the bid. Cashless payments must be made at no charge to the auction house and are only accepted as conditional payments. Credit card payments can unfortunately not be accepted. The Auction House shall store and insure the auction item, which shall be collected by the successful bidder, for the hammer price at the Auction Houses own expense for two weeks after acceptance of the bid. Upon expiration of the 2-week period after the acceptance of the bid, the Auction House is entitled to authorize a forwarding agent to store and insure the auction items in the name and for the account of the successful bidder or store such items on its own premises against payment of a fixed daily rate for storage and insurance costs. The said fixed rate depends on the size of the item and ranges from €1.00 to €5.00 per day, per auction item. Any auction item accepted by bid shall be exclusively transported in accordance with the written instructions of the successful bidder. The Auction House shall only be liable for the proper delivery of the auction item to the forwarding agent, courier or any other persons designated to carry out the transport. It is the successful bidder’s own responsibility to obtain the required export documents, particularly permits related to cultural heritage protection laws and CITES permits. Hampel Fine Art Auctions GmbH & Co. KG offers to assist the client in applying for any CITES paperwork for a fee of € 200 / per object (regardless of the application’s success). US law restricts the import of several watch brands. Hampel Fine Art Auctions GmbH & Co KG cannot give any advice importing these items. Hampel Fine Art Auctions Gmbh & Co KG reserves the right to remove bands made of leather derived from endangered or protected species. The import of such items can be forbidden in some countries. For further informations please contact the local customs authority. All dimensions given, unless otherwise specified, are those of the piece of photographic paper on which the photographic image is printed (including margins). The timekeeping and waterproofness or water resistancy of watches cannot be guaranteed under any circumstances. CColoured stones: In the centuries-long history of precious stones, these may have been processed in various ways to enhance their colour. This in itself is not a flaw as many methods that do not damage the stones are well known in expert circles. In individual cases, Hampel Fine Art Auctions GmbH & Co KG will ask for corresponding expert opinions, which are explicitly stated in the descriptions. Our terms and conditions of auction as listed at the end of this catalogue as well as here and in our auction rooms in Munich shall apply regarding all business relations towards buyers and consignors. We are happy to receive your items at any time for one of our auctions, which are held four times a year (spring, summer, autumn and winter). You will find information on the specific dates and themes of the auctions in our auction preview. The first step putting your art object up for auction is a valuation that is carried out on our premises or in your home, and which is conducted free of charge. We consider it worthwhile to carry out a preliminary valuation from printed or digital photos. The photographs often help us decide whether your items are suitable for our art auctions. In the case of a valuation on the premises, a catalogue price will be recommended if you should not have any price proposal of your own. In consultation with you, we will also agree on a minimum sale price (reserve price or limit) below which the item may not be sold. Valuation via photo does not, of course, allow for an exact assessment as defects, restorations or age-related conditions cannot be identified due to the size of the image. If the item is suitable for auction we will provide you with a preliminary recommended price on the basis of this initial valuation. However, if defects of any kind are revealed on delivery, we reserve the right to subsequently adjust the estimated price. Once the decision has been taken to auction your art object on our premises, you and Hampel FineArt Auctions will sign a contract. The contract includes a number of important agreements between you and Hampel Fine Art Auctions, such as setting the lowest possible valuation and the limit under which your property may not be sold by us, as well as the sales commission deducted by Hampel Fine Art Auctions GmbH & Co KG in the event of a sale and your assurance that you are the owner of the item. Copyright laws require Hampel Fins Art Auctions to charge a so-called right of resale fee on works of art created after the year 1900. The buyer and seller each pay half of this fee and it is shown as a separate item on the final statement. All items delivered by our sellers are presented to interested buyers six days prior to auction in an exhibition on four floors, covering a total surface area of 1,300 square meters. Our staff is available to advise potential customers throughout this period. During this time, your item is insured at the minimum price. Your items are sold by auction to the highest bidder and they remain in our safekeeping until the full sale price has been paid by the buyer. Generally, you will receive a statement from Hampel Fine Art Auctions GmbH & Co KG approximately six to eight weeks after the auction – although not until Hampel Fine Art Auctions GmbH & Co KG have received payment from the buyer. The statement states the price at which the item was sold and the deduction of the sales commission, the ancillary costs agreed upon in the auction contract and the right of resale fee. Payment of the final amount shown on the statement can be made to you in cash, by check or by bank transfer.